The Spring 2010 edition of CTR is devoted in its entirety to exploring the mind-body connection. To this end we have invited scholars from the disciplines of theology and psychology to address the issue. Mind-body research is an exciting field of inquiry. Neuroscientists are beginning to prove quantitatively the amazing power of the human brain to accomplish tasks hitherto unthinkable. Now biblical scholars are beginning to ask what relationship exists between soul (mind, spirit, personality) and brain. Our authors address this question from different perspectives. Joel Green, Associate Dean for the Center for Advanced Theological Studies and Professor of New Testament Interpretation at Fuller Theological Seminary (CA) pens our lead article. Green argues that a dualistic view of the human person (body and soul) is inconsistent with both science and Scripture. His book, Body, Soul, and Human Life: The Nature of Humanity in the Bible (Baker, 2008), which deals in-depth with this subject, has caused quite a stir among biblical scholars, even to the point that an entire section, including a panel discussion, at the Society of Biblical Literature (SBL) annual convention was devoted to assess Green’s thesis. In this article Green presents his case for human monism, offering case studies and Scripture exegesis to support his position. 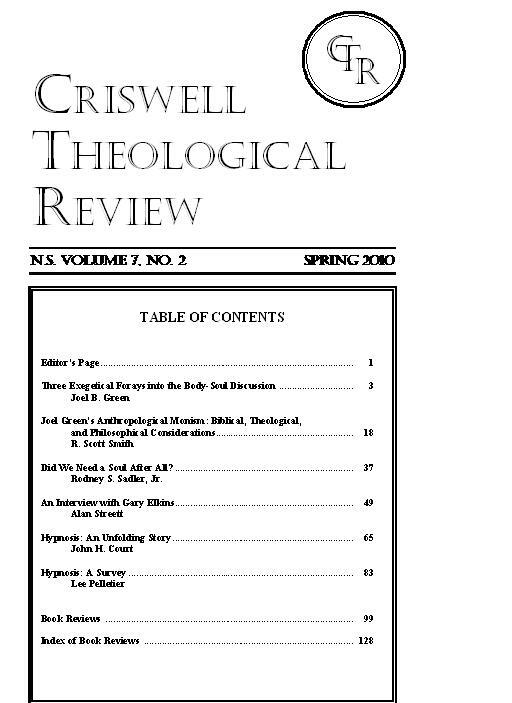 Scott Smith, Associate Professor of Ethics and Christian Apologetics at Biola University (CA), writes our second article, “Joel Green’s Anthro-pological Monism: Biblical, Theological, and Philosophical Considerations,” in which he challenges Green’s presuppositions, methodology, definitions and conclusions. Smith makes a case for a traditional anthropological dualism (body and soul), and points out that if personhood is inextricably bound up with our physicality, as Green suggests, then it was so in Jesus’ case. Thus, when his body died, Jesus the human person also died, i.e. ceased to exist. Smith finds such conclusions troubling. Our third entry comes from the creative pen of Rod Sadler, Associate Professor of Bible at Union Presbyterian Seminary (Charlotte, NC campus), who offers a witty, yet critical article-length review of Joel Green’s book Body, Soul, and Human Life. For those who have not yet read the book, this is an excellent overview and evaluation, which might whet your appetite to purchase and read it in its entirety. The editor of CTR conducts a fascinating interview with Gary Elkins, Professor of Psychology and Director of Clinical Training at Baylor University (TX). Elkins is a mind-body specialist who is on the cutting edge of scientific research in the field. He has studied extensively mind-body interventions, and particularly the therapeutic use of hypnosis to treat various physical illnesses. He has also conducted scientific investigations into the efficacy of prayer on those recovering from a hospital stay. The National Institutes of Health recently awarded him a $2.6 million grant to continue with his research. John Court, a retired professor at the School of Psychology, Fuller Theological Seminary (CA), and author of the book Hypnosis, Healing and the Christian (Wipf and Stock, 2002), now retired to Australia, analyzes the legitimacy of hypnosis as a therapeutic tool for Christians. He addresses both the positive and negative sides of this controversial mind-body modality. While recommending its use as an adjunct to other treatments, he warns of its potential danger in the hands of untrained practitioners. Lee Pelletier, President of the Clergy Special Interest Group of the National Guild of Hypnotists, shares with CTR readers the preliminary results of his ongoing survey on clergy attitudes toward hypnosis. What do most ministers believe about hypnosis? Do they associate it with the occult and demon possession? Would they recommend hypnosis to a church member who wishes to quit smoking? How many have consulted a hypnotist themselves? You may be surprised by the answers. These findings provide insights into where clergy get their information and how they form their opinions about hypnosis. We close out the journal with 30 pages of book reviews of some titles that have come recently off the presses. We hope these reviews help you as you seek to spend your money wisely on book purchases. Hi, There doesn’t seem to be a way to contact the editor other than by leaving a comment, so … is CTR available by subscription as PDF or will it be? Pls. respond by email to rich.robinson@jewsforjesus.org. Dr. Streett, would you contact me at calvinist12345@gmail.com ? …and keep up the God work! PS: If you haven’t yet read “REV 13: THE MARK OF THE BEAST: 666! HAVE YOU BEEN DECEIVED WITH THE MARK OF THE BEAST?”, which is a one page summary of the above with additional information, just ask for it. George Fox (a true Christian Quaker, 1624-1691) on baptisms and the Holy One who must baptize us from “The People of God, in scorn called Quakers, their Love to all Mankind Asserted”: So your directory and church faith, as you call it, may lie and mould for we understand according to sobriety. That as God hath dealt to every man the measure of Faith, His Gift, so he is to walk by, in which he pleases God through Christ Jesus. Whom all Christians must look unto, Jesus, who is the Author of their Faith and Finisher of it. Who is the Author of ours, Glory to God forever! And the wise man’s eye is in his Head, Christ Jesus, who is the Head of all. Who bruises the serpent’s head that led men from God and hath been between men and God. And he that doth this, leads man again to God, to wit – Christ, who is the True Baptizer. Who baptizes with Fire and with the Holy Spirit! Whose fan is in His hand and He will cleanse His floor, the floor of your hearts. And will gather His wheat into His garner but will burn up the chaff with unquenchable Fire. And they that know this Baptizer, to wit – Christ, are the true Christians and will never plead for the chaff, their body of death and sin to the grave. For when Christ sets Fire in your hearts and minds, that never shall be quenched till the chaff is burnt up. Such will not plead for the chaff but for Christ and His Baptism, which we own, and would have all people come to. For in the time of the Law, things were to pass through the fire and water, to be made clean. So you must pass through Christ’s Fire and Water, which purifies and washes, before you will be clean to enter into His Holy Kingdom and know His Baptism, as in Lk 3:16-17. For Simon Magus may go into the outward water and yet not come to Christ’s Baptism and think he can buy the Gift of God for money, which was judged by the apostle and by all that be in the same Spirit. And this is the one Baptism: “for by one Spirit we (the true Church) are all baptized into one Body, whether we be Jews or Gentiles, bond or free, and have been all made to drink into one Spirit.” And for want of (the lack of) this Spirit’s baptizing of you and you drinking into it, there are so many bodies and sects in Christendom, and so many baptisms and ways. And so do not drink all into one Spirit, in which the unity and fellowship and the bond of the Prince of princes’ Peace is, which we say all true Christians are bound to keep. And then they will seek the good of all men and the Peace of all men. Let them be of several sects formerly, yet by one Spirit they are all baptized into one Body. As they come to the Spirit then they drink into one Spirit, then here is fellowship in the one Spirit, 1Co 12:13. So all Christians are to endeavour to keep the unity of the Spirit in the bond of Peace. “O you kindreds of the people! Ascribe unto the Lord worship and honour!” Ascribe them not unto yourselves because they [the apostles] also, who have declared it unto you, have not declared their own but His honour. Do ye then “ascribe unto the Lord worship and honour” and say, “Not unto us, O Lord, not unto us but unto your Name give the praise!” Put not your trust in man! If each of you is baptized, let him say, “He [the Lord Jesus Christ] baptizes me,” of whom the friend of the Bridegroom [John the Baptist] said, “He baptizes with the Holy Spirit!” For when you say this, you ascribe unto the Lord worship and honour! “Ascribe unto the Lord worship and honour!” [Amen! Amen!] From Augustin’s exposition on Ps 96, paragraph 8, written circa 400 AD. Augustin on Baptism from the Gospel of John, Tractate 5.6. Since, then, John [the Baptist] had accepted a baptism which may be properly called “the baptism of John” but the Lord Jesus Christ would not give His Baptism to any, not that no one should be baptized with the Baptism of the Lord, but that the Lord Himself should always baptize, that was done, that the Lord should baptize by means of servants, that is to say, those whom the servants of the Lord were to baptize, the Lord baptized, not they. For it is one thing to baptize in the capacity of a servant [as John the Baptist was], another thing to baptize with Power. For [His] Baptism derives its character from Him through whose Power it is given, not from him through whose ministry it is given.